Designed to prevent the effects of suspension trauma when an operative is restrained by his height safety equipment, after a fall. Even short periods of suspension at height can cause negative health effects. This product prevents that by allowing the operative to “stand” in the loops to relieve pressure being applied to the top of the legs. 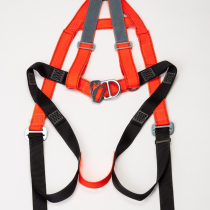 Can be retro fitted to most harnesses on the market, including our own RGH2 Scaffold Harness, compact and lightweight and once installed are ready to use whilst being non intrusive during day to day work.